In November of last year, young activists with Sunrise Movement held a sit-in at Nancy Pelosi’s office in DC demanding that she support a select committee on climate change to propose a Green New Deal. 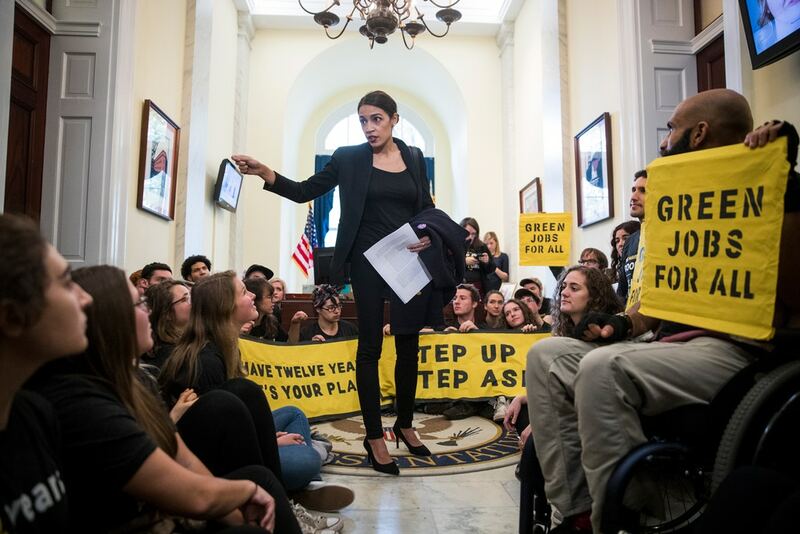 They were joined by newly elected democratic socialist Congresswoman Alexandria Ocasio-Cortez (AOC) who has since been a champion of the Green New Deal demand. AOC said “Should Pelosi become the next speaker of the house, we’ve got her back in pursuing the most progressive energy agenda this country has ever seen” (sunrisemovement.org). It is exciting and absolutely correct for AOC to join with activists in building a movement for a bold proposal to begin tackling climate change. However, Nancy Pelosi has no intention of pursuing a Green New Deal and AOC should not build illusions in her. AOC’s call for a Green New Deal stands in stark contrast to the strategy of the corporate Democrats like Pelosi who offer carbon taxes or a carbon credit system that do nothing to actually end pollution or transition to a green economy. Such a strategy flows logically from the Democratic Party’s cozy relationship with the oil and gas industries. Fossil fuel executives are a lot of things, but they’re not dumb with their money. They’ll donate reliably to those who represent them and try to buy off the rest who have yet to fall in line. Just two months after the Democratic National Committee (DNC) pledged to refuse oil PAC money last June, they reversed their decision. Pressure from progressives was not enough to keep fossil fuel money out of the DNC’s pockets. It’s not surprising then that the Democratic establishment shut down AOC’s proposal that committee members should reject fossil fuel money. It has been the movements in the streets, as well as increasingly dire reports from climate scientists, that have shifted any talk about the environment. We need candidates and elected officials that see building such movements as a central part of their job. A Green New Deal would be a huge step toward the democratically-planned socialist economy that will be necessary to end climate change and poverty and raise living standards in a sustainable way. The general proposal that AOC has advocated would rapidly transition U.S. energy production to 100% renewables by 2030 through a federal jobs program that guarantees retraining and job placement for workers currently in fossil fuel jobs. It’s no understatement to say this would be the boldest action ever taken to combat climate change in the U.S. Actual legislation could have been drafted by a select committee on a Green New Deal in the House, but Nancy Pelosi struck it down and formed a toothless committee. A green jobs program would speak to the millions of workers who have lost good paying industrial jobs and those who fear losing those jobs. For any environmental proposal to succeed, it needs to win over industrial workers, like coal miners, who have lost faith in the corporate Democratic Party and have been seduced by Trump’s call to “make America great again.” Corporate Democrats are incapable of reaching those workers with their neoliberal policies. What’s also striking is the potential the Green New Deal proposal has to change the course of the environmental movement. The greatest failure of the environmental movement for the past several decades has been an inability to address the concerns of workers, particularly those with jobs in fossil fuel production. Carbon taxes, for example, are unappealing because they are easily framed as “gas taxes” which will be passed on to working people at the gas pump. It’s one reason why so few carbon taxes have been passed in the U.S. and why the yellow vest movement was sparked in France. Climate change is a global issue and an international movement of working people is vital if we want to stop it. It will take massive mobilizations, like 2014’s People’s Climate March, to win the bold step for a Green New Deal program. Such a victory would provide a massive lead not only in tackling climate change, but also giving direction to activists in other countries. But we need an even bigger transformation to end climate change. We should combine the proposal for a green jobs program with a call for taking the fossil fuel companies into democratic public ownership and retooling them for sustainable production in the interests of workers and the environment as part of a necessary overall socialist transformation of society. How Could We Win a Green New Deal? The biggest obstacle confronting the Green New Deal isn’t low popularity or Republican obstruction, it’s big oil’s representatives in the Democratic Party. A recent poll found that 80% of registered voters support a Green New Deal, including 92% of Democrats and 64% of Republicans. But the Democratic establishment, Trump, and Republican politicians all oppose the Green New Deal. Fundamentally they defend corporate interests. AOC proposed to fund a Green New Deal with a 70% marginal tax rate on incomes over $10 million. This is a bold demand though as some have pointed out it’s not unprecedented given that in the 1950s the marginal tax rate on the super rich was actually 90%. We should tax the rich, who have profited off of destroying our environment, to fund green jobs! A Green New Deal would be fought severely by the billionaire class. A rapid transition to 100% renewables would be a mortal blow to the fossil fuel industry – one of the most profitable sectors in the economy. This is why the movement cannot rely on parties and politicians that accept money from corporations whose only interest is greater profits. If neither of the two parties will fight to stop climate change, we need one that will. While it is very significant to have even a handful of progressive public representatives taking a bold stand, the determining factor in winning social change is the strength of mass movements. After French President Emmanuel Macron proposed the hated fuel tax late last year, the yellow vest movement not only forced him to reverse it but won an increase in the minimum wage and other concessions. That kind of mass movement being democratically organized through a new party, rooted in the working class and oppressed communities, could win a Green New Deal. Armed with a socialist program it could win a new world. Next articleVenezuela: For Mass Mobilization of Workers to Build Real Socialism and Put an End to Corrupt Bureaucracy!